The National Renewable Energy Laboratory got a higher than expected response rate'54 percent'on a recent employee survey via the Web. It didn't hurt that the survey was dressed up with graphics and photos of NREL workers, said Roger Forsyth, improvement program manager in the Quality and Assessment Office at the Golden, Colo., Energy Department lab. to its recent Web survey to build interest. The survey used InterForm99 software from Raosoft Inc. of Seattle. 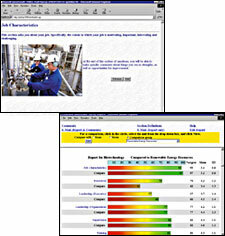 Top managers had reports available by browser as soon as the survey period closed. Red bars on reports indicate areas for possible management action. NREL handles the department's research into renewable energy technologies such as wind and solar power, alternative fuels, hybrid vehicles and geothermal energy. Most of NREL's employees are in Colorado, either at headquarters or at the wind technology center in Boulder. A small group works in Washington. Before Forsyth joined NREL in January, the human resources department had conducted occasional, limited surveys. 'This was our first concentrated effort to get a sampling of the entire lab,' he said. As a recent Air Force retiree, Forsyth was familiar with that service's Web-distributed Chief of Staff Survey [GCN, Jan. 24, Page 33], developed with InterForm99 software from Raosoft Inc. of Seattle. He said NREL officials chose the same software for the lab's spring 2000 survey because of its ease of implementation and the company's expertise. 'We didn't have to train somebody to use the software or to go in and program it,' he said of the template-based InterForm. Forsyth started work on the survey in mid-January. He flew to Seattle to work with six Raosoft programmers on formatting the questions and the reports that would be generated from the data. The NREL survey reused some of the Air Force survey's questions. Forsyth revised other questions to fit the energy lab's civilian work force. The survey ran on a Raosoft Web server under Linux, company president Catherine McDole Rao said. Forsyth sent the survey's private uniform resource locator to all lab employees via e-mail, along with instructions to sign on using a made-up name and password. Although the questionnaire was anonymous, it asked each respondent to enter general job classification, gender, length of employment and approximate age. That let managers analyze the answers of supervisors and subordinates separately. The software randomized the sequence in which respondents viewed the question categories. Randomization increased the validity of the results, Forsyth said. At the end of each section, users could comment on the topics, review their answers or proceed to the next group of questions. A small bar graph at the top of each page kept a running tab on the percentage of questions completed. The password feature let respondents stop and restart at a later time. 'As long as you remember your password, you're fine,' Forsyth said. To increase the attractiveness of the survey, Forsyth and his team added photos from the lab's intranet library. He said they tied in with the question topics, from training to communication. A total of 491 employees answered the browser survey during a two-week period in May. The 54 percent response rate was far higher than the usual 20 percent to 25 percent response rate for employee surveys, Forsyth said. The respondents' demographics matched fairly closely with the overall distribution of employees' ages and terms of service. Once the survey period ended, Raosoft sent NRL the raw data in Microsoft Excel spreadsheet format. Using its soon-to-be-released WebReport software, the company also provided Forsyth with links to formatted reports analyzing the data. 'The results were available almost immediately after the closing of the survey,' Forsyth said. He distributed the reports electronically to senior staff. Lab managers are now reviewing possible actions based on the survey results. And they are scheduling meetings to tell employees about the results. NREL paid Raosoft $44,000 for everything involving the survey'Web development, implementation and reporting. That was much less than other survey estimates, Forsyth said. 'If you want to put your own twist on survey questions, that's when you run into additional costs,' Forsyth said. Some off-the-shelf survey software restricts the amount of customization by users, he said. Forsyth has had inquiries about the survey from NREL's external customers and stakeholders, but not from other federal agencies. In the future, NREL plans to gather employee feedback annually, using the 2000 results as a baseline. 'I think the leadership at NREL is committed to this being part of a system for improvement, rather than just an isolated event,' Forsyth said. Although NREL officials want consistency in the future assessments, there will be more opportunities for respondents to describe why they agree or disagree with various statements. NREL is also considering a survey of its stakeholders' opinions about the lab's products and services.